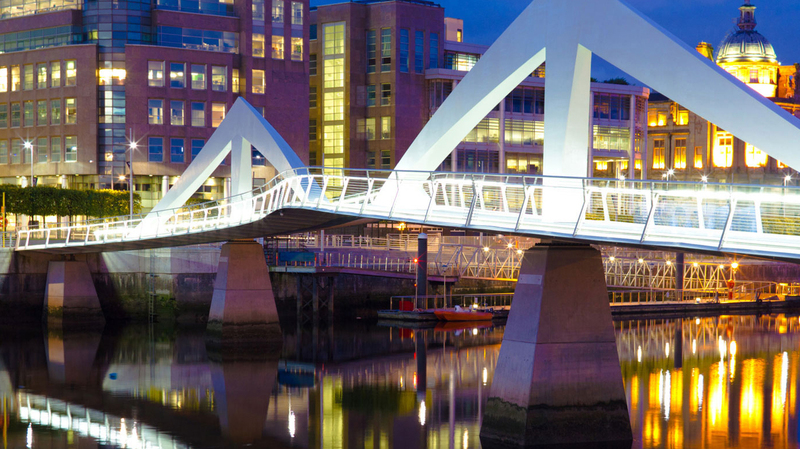 Search for the best flight prices from Manchester to Glasgow. Compare prices, book today and save money with Manchester Airport. A proud modern city scrubbed-up and ready to go, Glasgow isn't just a proud modern city with a famous industrial heritage. It's the gateway to some of the UK's most spectacular scenery, just an hour or so up the coast. Stay in town and shop until you drop, share its footballing fever or take to the hills. The choice is yours. Glasgow's hotel scene has recently received a revamp courtesy of some luxe new offerings. But holding its own against the new crowd, the established Hotel du Vin at One Devonshire Gardens (1 Devonshire Gardens) boasts lavish decorations and a fabulous bistro, and is a hangout for famous names and the well-heeled. It's rivalled by the contemporary Radisson Blue Hotel (301 Argyle Street), that's housed within an award-winning building. At the budget end of the market, Ibis Glasgow City Centre (220 West Regent Street) provides cheap and cheerful accommodation in the city centre, while the Willow Guesthouse (228 Renfrew Street) is a cosy, family-run B&B. Where fashion is concerned, Glasgow certainly competes with the big boys on the international style scene. Locals call the city centre the "Style Mile" for its concentrated collection of boutiques and department stores. You'll find Buchanan Galleries (220 Buchanan Street) here, with its stellar line-up of classy brands, as well as the designer-heavy Princes Square (48 Buchanan Street). The West End is a focus for vintage shops, such as Circa Vintage (37 Ruthven Lane), while both fashion and flea market bargains abound at the Sunday car boot sale in the Blochairn Market Complex (130 Blochairn Road). Glasgow is famous for its curry culture, and popular establishments such as The Wee Curry Shop (29 Ashton Lane) and Shish Mahal (60-68 Park Road) have achieved mythical status among Glaswegian gourmands. You'll need to venture outside of the city limits to find a Michelin-starred establishment, but Brian Maule at Chardon d'Or (176 West Regent Street) comes close to achieving the coveted accolade with its creative and well-executed range of dishes. The gastropub atmosphere at the 78 (10-14 Kelvinhaugh Street) sets the scene for a scrumptious and well-priced menu, while deli kitchen Delizique (70 Hyndland Street) is the locals' choice for home-baked cakes and brownies. Celebrating Scottish culture with a succession of ceilidhs, workshops and traditional music performances, Celtic Connections is a staple of the Glasgow calendar. More than 300 events take place over the course of the 18-day festival, many attracting audiences of thousands. Get ready to belly laugh your way through this brilliant festival, which has showcased big names such as Jimmy Carr, Paul Merton, Al Murray and Sean Locke. The festival has been the springboard for many of the industry's funniest figures, so it's also a good place to spot the rising stars of the comedy scene. The largest cultural event in Glasgow, this incredibly diverse festival takes place in more than 80 venues across the West End. Expect a range of exhibitions, performances, workshops and screenings, as well as torchlit processions and family parades. Dating back to 1987, this long-running jazz event has hosted everybody from Sarah Vaughan and Chick Corea to Benny Carter and Miles Davis. The Late Night Jazz Club sessions are the most hotly anticipated concerts of the festival and feature the stars jamming together in a casual environment. This annual celebration of LGBT culture is one of the largest of its kind in the United Kingdom. It represents almost every form of cultural expression, from music and dance to comedy, art, theatre and literature.